Herons Watch, named for the Great Blue Herons in the area, is a house in a small Cul-de-sac community surrounded by dunes, Ol'e River canal and nature. Enjoy fishing, crabbing and kayaking on a private 10 x 30 ft private dock on a deep water canal. 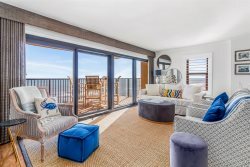 You will love the views of the pristine Gulf of Mexico with beach access just a quick walk across the street and down to the beach dune walkover. This house is nestled in the middle of Perdido State Park and nature trails. Heron's Watch Down is a first floor unit with ceramic tile throughout 2 bedroom 1 bathroom with a fully stocked Kitchenette that will sleep 6 people. Bring your water noodle and float mindlessly in the canal – who knows, one of our resident dolphins may pay you a visit! This property is perfect for fishermen, boaters and beachcombers. I enjoy myself every time I stay on one of your properties. Its always clean and just enough space for me and my family. Thank you see you again. The rental property has the basic necessities; all we need for a no fuss vacation. The area is quiet and safe! Minimalist concept but we loved being on the Old River. Perfect launching place for the kayaks and just a short walk from the beach. Very easy bike to restaurants at the Marina as well.